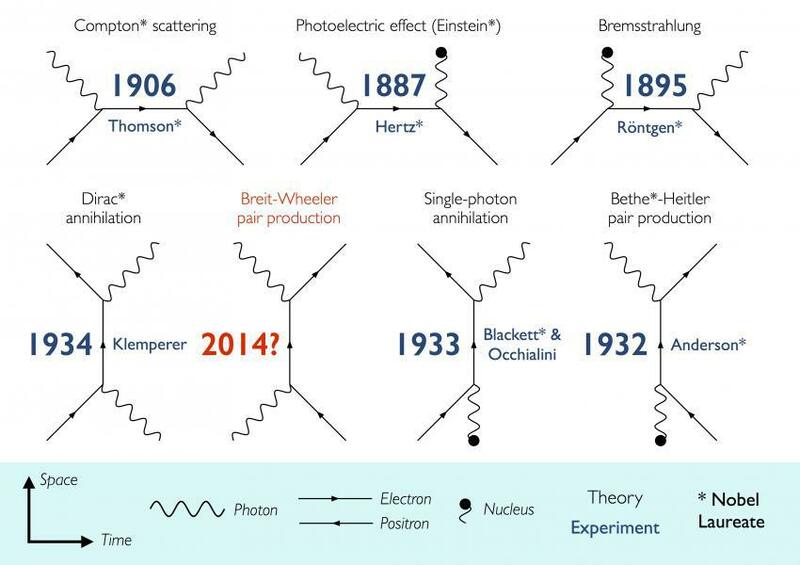 Breit and Wheeler proposed in 1934 that it should be possible to turn light into matter by smashing together two particles of light to create an electron and a positron – the simplest method of turning light into matter ever predicted. I would like to know if some day could be possible to demonstrate this idea? Well Gaby and Martin, thanks a lot for the question and I bet this was triggered by the mention of Breit and Wheeler in recent weeks. As you rightly mention, Gregory Breit and John Wheeler proposed the mechanism in a Physical Review A paper entitled “Collision of two light quanta” (PRA 46, 1087; 1934). Although the mechanism was presented about 80 years ago, the difficulty in preparing the gamma rays to be collided has been a great issue to overcome. Back in 1997, researchers of the Stanford Linear Accelerator Center managed to carry out a multi-photon Breit-Wheeler process: They used a stacked way to crate the electrons and positrons using high energy photons that were generated using electrons. So the idea was to a certain extent demonstrated back in 1997, but the production of the electron-positron pair in one single shot is yet to be seen. The difficulties have now deterred persistent physicists and I am pleased to tell you that efforts continue. In particular, the researchers Pike, Mackenroth, Hill and Rose, from Imperial College London published a paper in Nature Photonics called “A photon-photon collider in a vacuum hohlraum” (Nat. Phot. 8, 434; 2014). By the way a Hohleaum is a cavity whose walls are in radiative equilibrium with the radiant energy within it, the word comes from German and it means “cavity” or “hollow room”. In their paper they present the design of a novel photon–photon collider where a gamma-ray beam is fired into a hohlraum. The theoretical simulations in the paper suggest that this setup can produce about 105 Breit–Wheeler pairs in a single shot. If that is the case, the setup could provide the trail to a first realisation of a photon–photon collider and demonstrate the mechanism that Breit and Wheeler talked about. I’m really interested in the light to matter route since if you follow it out you get replicators as in Star Trek. Imagine that. What features should I implement in an interactive dashboard?